Over eighty years experience in the design and manufacture of flaking equipment makes the Simon Drum Flaker the most effective single piece of process equipment for the conversion of materials from the molten or liquid state to easy to handle solid flakes in a single operation. This change of state is achieved by applying a film of the material to be flaked to the outer surface of a horizontal rotating drum which is cooled internally by means of water, brine, glycol or any other suitable coolant. As the drum rotates, the liquid film solidifies and is subsequently removed from the drum surface by a doctor blade or knife. Top Feed, where the molten product is poured into a feed box mounted over the flaking drum. For materials with super-cooling properties, various modifications to or combinations of these feed systems may be used. Top Feed Flaker showing Enclosure with windows Flaking drums can be manufactured in a wide range of materials including carbon steel, cast iron, chrome/nickel plated cast iron, stainless steel, nickel/chrome alloy steels and even bronze. 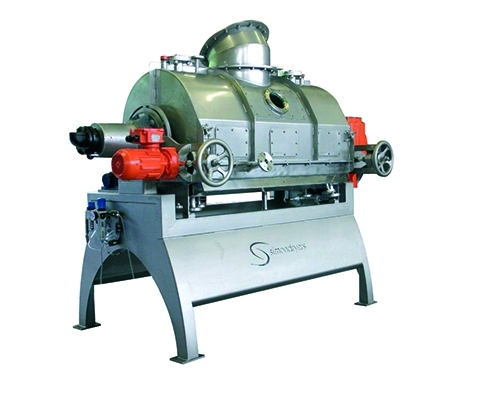 The present generation of Simon Drum Flakers provide an economical, both in terms of running costs and space requirements, easy to operate and maintain system for flaking a wide range of organic and inorganic chemicals with melting points ranging from little more than ambient to in excess of 300°C. Dip Feed Drum Flaker The most widely used form of the drum flaker, as it is simple and very effective. A film of the molten product is picked up on the surface of the flaker drum as it rotates through a feed tray mounted below. The feed tray is usually heated by steam, thermal oil or electric heating panels. Drum Flaker with Applicator Roll For products that do not readily adhere to the main flaking drum, an applicator roll may be used. The molten product is picked up by the applicator roll from the tray and applied to the drum. The position and speed of the applicator roll may be used to influence the size and type of flakes produced. Drum Flaker with Weir Feed Certain products 'super-cool' and do not solidify when cooled below their melting point. The weir feed c onfiguration helps to induce crystal formation on the main drum to produce a solid cool flake at the knife. Drum Flaker with Top Feed The top feed configuration may be used to minimise the time that the molten product remains in the feed area before being applied to the drum. It may also be used for products that do not easily adhere to the drum after solidification as gravity keeps the partially solidified product in contact with the cooled drum.